Subtitled "A Look Inside Government Secrets and Classified Documents on Bizarre Creatures and Extraordinary Animals"
Monster expert Nick Redfern returns with a new title exploring the many unexpected government files on mysterious creatures great and small. 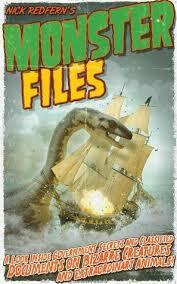 He sets his 'Monster Files' out in chronological order in order to illustrate the way clandestine research into cryptozoology changes over time, as events shape the world. What emerges is a fascinating insight into the motivation of government officials and military who keep a careful eye on all things weird. Often, cover-up is the order of the day, although not necessarily because of the discovery of weird beasts. In Britain, Redfern cites a couple of examples where unexplained events occurring on the land of the rich and powerful of English society caused difficulties. In 1942, the hunt for a downed German airman through woods in Devon ended in an unexpected and deadly encounter with a 'werewolf'; a mystery with a fascinating and unpredictable conclusion. Perhaps even more remarkable, is the strange case of the big cat observed by military officers undertaking covert surveillance of Diana, Princess of Wales during her secret affair with Major James Hewitt. This encounter had uncomfortable consequences for the investigator who became involved in the case, long before news of Diana's affair broke through to the media. Big cats in Britain and Australia remain a contentious subject, covered well by Redfern. One becomes convinced of the overwhelming evidence that some large cats prowl in the wilds of both countries - and the careful neglect of the authorities in trying to get to the truth of the matter. Public panic and tabloid sensation seem the main motivating factors for governments to lie low about the feline hunters at large in the countryside, irrespective of the number of well-observed encounters. Another recurring theme in the book is how monster reports in official files mask or inadvertently describe top secret military activity. For instances, rumours of lake monsters have circulated after members of the public observed experimental submersibles on lakes in the US and UK. Are these rumours purposely put about by the authorities to distract the public from the real activities going on in the lakes? Perhaps the truth behind some of the encounters described is similar to that of the plot of the 2012 BBC feature length Sherlock Holmes production of 'The Hound of the Baskervilles', where encounters with werewolves on the moors are linked to escaping psychotropic gases from an army research base. UFOs and Bigfoot may be convenient cover stories, or even part of some kind of psychological warfare/counter-intelligence activities undertaken by military units on occasion, often with remarkable success. Official interest in Bigfoot goes also includes very real concern about the impact of an actual discovery of a Bigfoot, and how any scientific acceptance of the existence of these legendary creatures might be handled. Concerns about preventing 'Bigfoot hunts' seem very real, as these animals would immediately become endangered, protected species. The book examines a great many encounters with Bigfoot. Notably, stories of fleeing families of Bigfoot prior to the Mount Helena eruption in Washington State mix with almost paranormal sightings of phantasmal creatures of Bigfoot proportions. The truth is hard to fathom when faced with such a variety of cases, but Redfern does an outstanding job of sorting through them all. 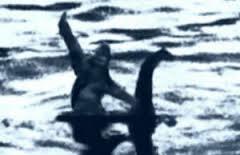 There's an intriguing possibility that lake monsters and Bigfoot might actually be the phantoms of long-dead creatures from prehistoric times. He also turns his attention to historic hunts for the abominable snowman, and how the adventurous cryptozoologists heading up these expeditions often had official connections, particularly with intelligence agencies. Were these expeditions to discover the Yeti simply a cover for spying missions across the Himalaya range at times of international tension, particularly with the neighbouring Soviet Union and People's Republic of China. Another of Redfern's passions is his interest in werewolf stories. He notes that a blog he posted about the alleged appearance of a werewolf near a cemetery in Cannock Chase remains his most popular, and describes many bizarre and fascinating encounters. I was not so sure he should have included cases from the 16th Century, however, as the 'confessions' of lycanthropy involved should inevitably be seen in the context of the extreme torture and prejudice of the witch trials of that era. Whether there is indeed a psychiatric explanation for some allusions to lycanthropy in deranged patients does not give such historical cases any real credence - any more so than confessions of consorting with the Devil in those times should provide evidence of the actual existence of Satan. That aside, 'Monster Files' is a highly entertaining and informative read; written in Redfern's stylish flowing prose, and sprinkled with his characteristic mix of insight, humour and objectivity.